Hmmm, can you ask them on FB, about EE2? 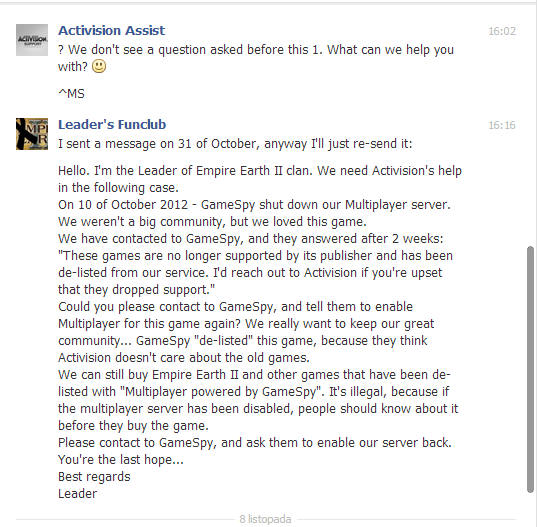 Well, I contacted Activision on facebook. My first message has been sent on 31 of October. I didn't receive the answer, that's why I wasn't posting in this topic. 10 December? 2 months after EE2 has been de-listed. 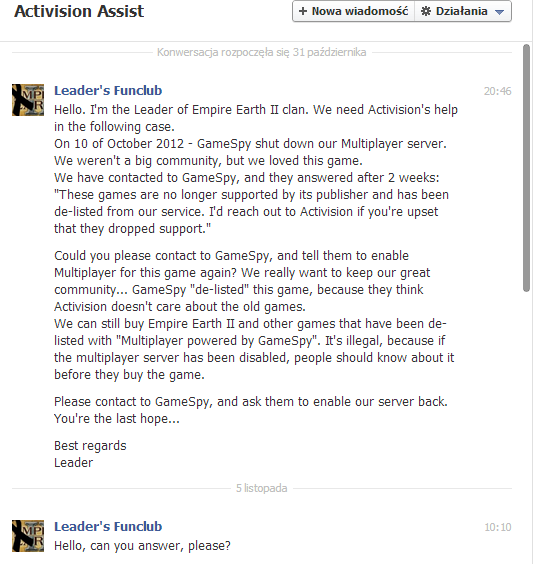 At least now we are not the only 1 community without GameSpy multiplayer left. There have been a number of reports regarding the recent discontinuation of service to several online multiplayer games previously supported by GameSpy Technologies. 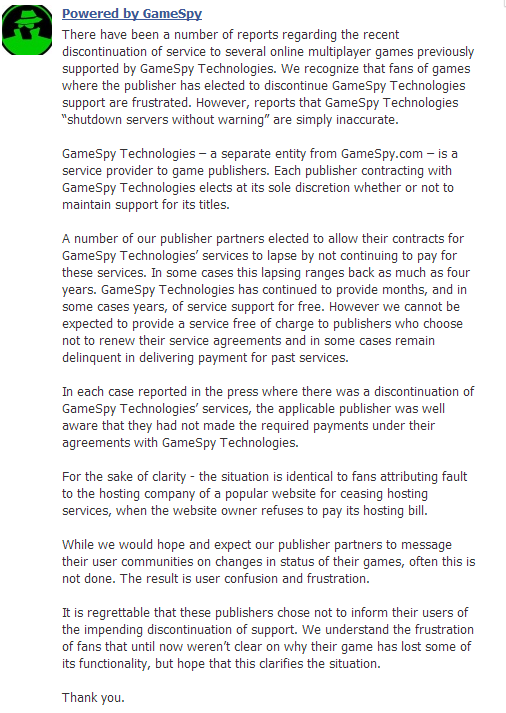 We recognize that fans of games where the publisher has elected to discontinue GameSpy Technologies support are frustrated. However, reports that GameSpy Technologies “shutdown servers without warning” are simply inaccurate. GameSpy Technologies – a separate entity from GameSpy.com – is a service provider to game publishers. Each publisher contracting with GameSpy Technologies elects at its sole discretion whether or not to maintain support for its titles. A number of our publisher partners elected to allow their contracts for GameSpy Technologies’ services to lapse by not continuing to pay for these services. In some cases this lapsing ranges back as much as four years. GameSpy Technologies has continued to provide months, and in some cases years, of service support for free. However we cannot be expected to provide a service free of charge to publishers who choose not to renew their service agreements and in some cases remain delinquent in delivering payment for past services. In each case reported in the press where there was a discontinuation of GameSpy Technologies’ services, the applicable publisher was well aware that they had not made the required payments under their agreements with GameSpy Technologies. For the sake of clarity - the situation is identical to fans attributing fault to the hosting company of a popular website for ceasing hosting services, when the website owner refuses to pay its hosting bill. While we would hope and expect our publisher partners to message their user communities on changes in status of their games, often this is not done. The result is user confusion and frustration. It is regrettable that these publishers chose not to inform their users of the impending discontinuation of support. We understand the frustration of fans that until now weren’t clear on why their game has lost some of its functionality, but hope that this clarifies the situation. For those who didn't notice: Unofficial Patch 1.5.5 has a new Multiplayer Lobby which works exactly the same as the GameSpy one.